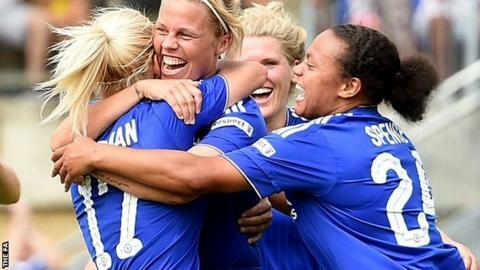 Holders Chelsea will host Manchester City and Arsenal are at home to Sunderland in the semi-finals of the Women's FA Cup. Chelsea beat City 1-0 at the same stage of last season's competition on the way to winning their first major trophy. Manchester City are the only side left in the Women's FA Cup never to have reached the final before, with Sunderland beaten by Arsenal in 2009. The semi-finals will be held on Sunday, 17 April. The final on Saturday, 14 May will again be played at Wembley. A competition-record crowd of 30,710 watched Chelsea beat Notts County 1-0 in the 2015 final, which was hosted at England's national stadium for the first time.